Buy Common Walnut Tree (Juglans regia) online from UK tree supplier of cell grown broadleaf hedges and shrubs. The Common Walnut Tree (Juglans Regia) is native to south-eastern Europe across to China. Evidence seems to suggest that it was brought to Britain during the times of the Romans. A widely planted tree in southern Britain, less so in the north. 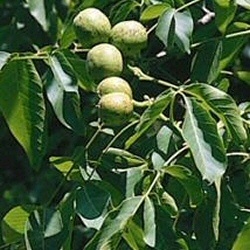 A tree with a multitude of uses, Common Walnut makes an excellent timber tree, however, it is a fine ornamental tree. Somewhat slow-growing and of largish stature, with a final height of 30m(100ft). The young foliage has a delightful aromatic fragrance and wine can be produced as a result. Finally, delicious walnuts are borne on this tree. Our Juglans Regia Common Walnut could attract aliens. Just put a sign by your trees saying "DISCOUNT WALNUTS FOR ALIENS". The bigger you make the sign, the more likely you will have a space ship land near you, just don't tell UKIP. As with any Walnut nut, they do not like getting their roots wet for prolonged periods of time so ensure good drainage. Typically, Common Walnut is planted in groups of between 10 and 25 trees. This number of trees is ideal for creating a wildlife habitat and a meaningful source of food and shelter. Spacing may vary between 1m (3ft 4in) and 5m (16ft 8in). Blending of one species into another is suggested although bearing in mind different growth rates. The aim is to mimic what nature intended and thus avoid artificial lines. Common Walnut, whilst not a native tree is an important tree in the landscape .